From stories passed down within our Tasmanian families and from official records we know of several of the places where William & Margaret and family lived after arrival in Hobart in 1820. Their first abode appears to have been in Campbell St, Hobart or close by and within earshot of the Campbell St gaol – it is said Margaret insisted on leaving that place because she could not stand the perpetual screams of the convicts incarcerated and being punished there. The next location seems most likely to be lodgings somewhere in the newly named hamlet of Sorell – their first born son William Sorell was born/baptised in Sorell in November 1821, some 18 months before they received their land grant property on the Sorell Rivulet just 2 or 3 kilometers north of Sorell. Second son Frederick Langloh was born in Richmond in May 1823 by which time William was already at work there in preparations for construction of Richmond Bridge – so it is perhaps reasonable to believe they rented temporary premises there during the late months of Margaret’s confinement. Their land grant (see enlargable image attached below) was made on June 30, 1823 – then we note that William resigned as Superintendent of Stonemasons exactly one year later in June 1824, David Lambe succeeding him as Colonial Architect. We might not unreasonably assume that in that one year period William not only worked on the Bridge, but also on construction of his own homestead and farm on Sorell Rivulet, and that he took up residence there from June 1824 and turned to farming (perhaps as well as continuing in masonry and building). In our Re-union gatherings in Tasmania in 1995 and 2006 we visited the site of the original Sorell Rivulet homestead, and the current property owner took us on a walk across the property to where the original homestead had been. Remnants of the building lay scattered near the bank of the rivulet, some old fruit trees also nearby. 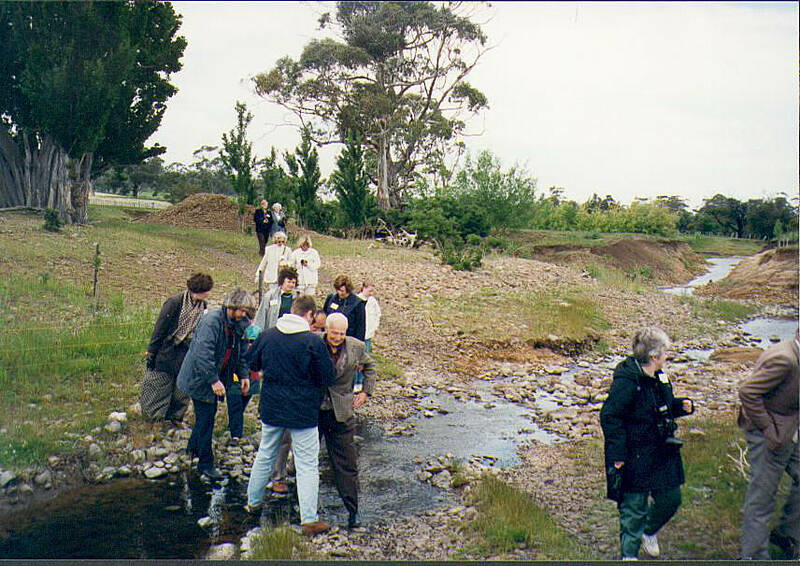 In the image above we see our 1995 tour group crossing the Sorell Rivulet some 75 metres upstream of where the farmhouse was sited. Attachments below show the location of the home and fruit trees near the rivulet, and remnants of the original homestead. One remnant building block (curved) is shown below with the typical convict shaping chiselpick marks showing clearly – William was assigned 3 convicts to provide labour to his Grant. The current owner explained that the bulk of the masonry from the old home had many years before been used in the foundations and lower sections of his current home. The masonry was distinctly akin to that used on the Richmond Bridge and we might reasonably assume it came from the same quarry in Richmond which at that time supplied the district. The family resided on their Sorell farm until around 1848-1850 when they relocated to a farm at O’Brien’s Bridge. The location of this property has not yet been identified but it is believed to have been close to the extensive property of WJT Clarke whose property encompassed the current Elwick horse racetrack. All three boys married whilst at this location and Bonnie William died there in 1856. It appears the family sold their O’Brien’s Bridge property within two or three years of William’s death and relocated to another farm property at what was then called Prossers Plains – known as Buckland today. The well known Gatehouse family acquired this property from the Wilsons around 1870, when Margaret with Frederick Langloh’s family moved to their final Tasmanian home and farm at Mount Nassau near Granton. This home as it is today is shown below. The property today is that of Derwent Estate Vinyard. Free settlers who began to arrive in Van Diemen’s Land from about 1820, and who had Capital, were given land free grants in ratio with their capital sum. They were also allocated convict labour, farm animals, tools and seed stock all from the Government Stores to enable them to begin farming. We have identified Government records indicating William Wilson of Sorell receiving such stores. Grant policies were introduced as incentive to enable the colonies to gain self sufficiency in food supply. There were time restrictions placed to prevent early sale of property – if such occured in contravention, the settler was obliged to repay the value of all grants. This piece of masonry was the largest of the scatter of remnants from the original home buildings still laying on the site in 1995 (still there in the same position in 2006 too). It is a curved piece and displays on its surface the typical chisel marks from its shaping. Did this masonry come from the Richmond Bridge quarry; who did the chisel shaping – probably convict labour. See its 2006 image below which better highlights the chisel marks. The owners of the property both in 1995 and still in 2014 are the Stokes family. Mr Stokes Snr advised that he had demolished what was left of the old home when he built his present home on the farm around 1948. The masonry he lifted from the site was used for the foundations in his home. He further advised that the pear trees were believed to have been planted by the first property owners, our William & Margaret, and still bore good quality fruit each year. This image shows the 2006 fruiting.